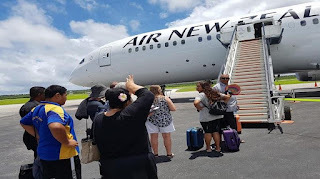 The seating of a sick passenger during Air New Zealand flight NZ 273 on Wednesday afternoon from Tonga to Auckland caused a brief disturbance and drew complaints from some passengers. About 170 passengers, who had been walking about 100 metres from the airport terminal to the aircraft were unhappy about having to wait in the sun while the passenger was loaded. Some passengers gave up and breached an order to wait at the foot of the stairway and walked up to the aircraft door. They were spotted talking to the General Manager of the Airport Terminal Service (ATS), Paul Karalus. Some passengers were overheard complaining that the staff at the terminal should have made sure there was no issue before releasing them to walk to the aircraft. However, Karalus said they realised they had an issue only after seating the first passengers who arrived at the aircraft. “It was during the movement of guests in the general boarding by both the forward and rear stairways that we struck the problem of one invalid who could not walk. “We use the aisle chair we use for such cases but she could not physically fit down the aisle,” Karalus told Kaniva News. “We had to quickly reassign her seat to be in the front of the economy section and advise the gate to reassign both her seat and that of the guest originally given the seat while slowly easing her into the seat,” Karalus said. Karalus, a former government Minister of Transport and Civil Aviation said the incoming flight NZ270 on Wednesday from Auckland to Tonga arrived late. “In such cases, we at ATS must endeavour to return the flight for an on-time arrival in Auckland and to the convenience of the passengers. He said there were 263 passengers on the flight from Auckland and 172 on the return leg. Once the first ambulift was empty and the passengers were seated, a general boarding call was made. Karalus said it was during this maneuver that he asked passengers at the foot of the forward stairs to wait until they cleared the way by seating the invalid before the front stairs could be used. Passengers were still able to use the rear stairs. He said passengers were kept waiting for no more than three minutes. The comfort of the elderly invalid outweighed the small inconvenience of the few guests who had had to wait for a little time before boarding, he said.